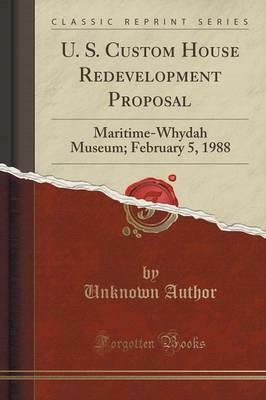 Excerpt from U. S. Custom House Redevelopment Proposal: Maritime-Whydah Museum; February 5, 1988 Dear Mr. Coyle: In April, 1717, the pirate ship, Whydah, sank in a storm off the coast of Wellfieet. Maritime Explorations, Inc. discovered the whydah and has excavated over 80,000 artifacts, to date, under auspices of the Board of Underwater Archaeological Resources of Massachusetts (the Board). The redeveloper, Maritime whydah Associates, proposes to establish a museum in the U. S. Customs House to display the whydah, making Boston the home of the only pirate ship found anywhere in the world. After engaging the architectural firm of Benjamin Thompson and Associates (master planners of Faneuil Hall) to provide the architectural feasibility of the Maritime Whydah Museum in the Customs House, the redeveloper obtained approval from the Massachusetts Underwater Archaeological Beard to move the Whydah artifacts to the Customs House. The museum would occupy the first four floors with the remaining tower being redeveloped into executive office suites, including the world headquarters for Maritime Explorations, Inc. The Museum of Science, Peabody Museum and the Peabody Museum of Salem will assist in developing and operating the museum. In addition to the Whydah, marine technology, oceanographic displays and other discoveries of Maritime Explorations, Inc. would be displayed, including artifacts from the Hussar, a British man-c-war recently discovered in the East River of New York. More imporatantly, the museum would develop an ongoing educational program in conjunction with the Boston Public School system that would utilize the excitement and interest of pirate folklore to explore several related subjects i.e. American History, Navigation, Archaeology and Oceanography. About the Publisher Forgotten Books publishes hundreds of thousands of rare and classic books. Find more at www.forgottenbooks.com This book is a reproduction of an important historical work. Forgotten Books uses state-of-the-art technology to digitally reconstruct the work, preserving the original format whilst repairing imperfections present in the aged copy. In rare cases, an imperfection in the original, such as a blemish or missing page, may be replicated in our edition. We do, however, repair the vast majority of imperfections successfully; any imperfections that remain are intentionally left to preserve the state of such historical works.